You might be wondering why I’m having a margarita on National Pie Day. Well, other than that fact that any day is a good day for a margarita, it’s mainly because my attempt at making pie crust this week drove me to drink. Fresh from my stellar artisan bread success over the weekend, my starry-eyed self ran to Homegoods on Monday and bought a bundt cake pan and a tart pan (the two piece type that has a removable bottom). I planned to break in that tart pan by making an amazing quiche from scratch with a blind-baked homemade crust. I raced home from work and immediately began making a series of rookie mistakes. First off, I didn’t thoroughly read the recipe all the way through. I had assumed that the pie crust dough would be the same as a dough I had experimented with over the summer, so I didn’t notice that the recipe I had chosen required a two hour rest period in the refrigerator! No matter, I thought, I’ll just look up another recipe. The second recipe I found also required a two hour rest! So, being solution oriented and not wanting to eat dinner at 9 p.m., I decided that 30 minutes in the freezer would do the trick…and it did…sort of. The dough was nice and chilled, but it was also hard as a brick and it took a heck of a lot more muscle to roll it out! Not to mention, it kept breaking which meant I had to patch it–so not pretty. I placed the dough in the tart pan and trimmed it flush to the top of the pan–another mistake as I would soon find out. I placed a sheet of parchment over the top and filled the pan with a pound of dried beans in order to weigh it down. After 25 minutes, I took a look and the crust had shrunken far below the top of the pan and had pulled away from the edges! I’m pretty sure this was because I trimmed it too close to the top edge. Not wanting to risk breaking the now very fragile crust, I attempted to remove the parchment and beans without taking the tart pan out of the oven. I saw the error of my ways unfold in slow motion as a full pound of blazing, hot beans exploded from my hands and scattered all over the kitchen! And then, of course, the cats rushed in to investigate and bat the beans around. The shrunken crust didn’t hold the quiche filling very well and the filling poured over the top of the crust and leaked out of the bottom of pan. Oh! I almost forgot: I had scooped up the beans and put them in an unsealed plastic baggie. You know where this is going, right? The husband came in, picked up the bag, and promptly spilled the beans all over the kitchen AGAIN! At least they weren’t hot that time. In short, I ended the evening exhausted, covered in flour and vowing to never make a crust from scratch on a weeknight again! After all that, at least it tasted good! So, with that…it’s cocktail time! And unlike pie crust, you can make a cocktail in less than 10 minutes–on a weeknight! Blood oranges are in season right now, so I hope that you will run, not walk, to your local grocery store or farmer’s market and get them while they are available! 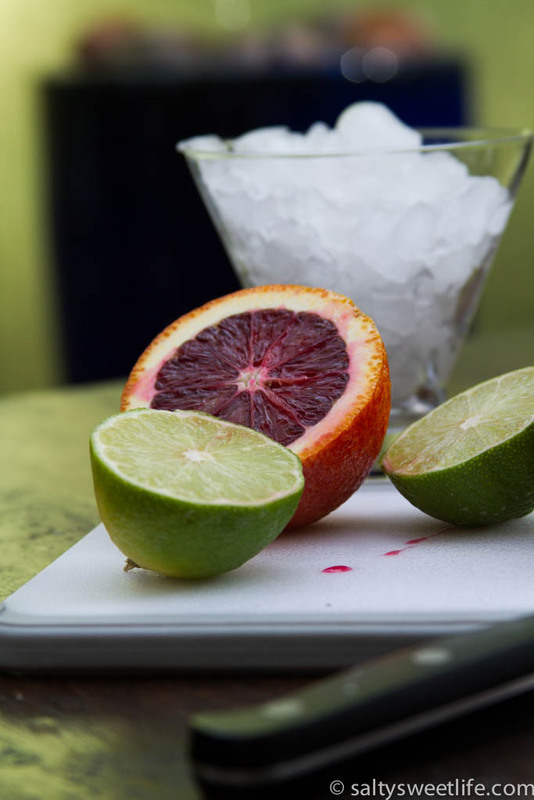 This cocktail was inspired by White on Rice Couple’s Blood Orange Margarita with Bitters. I’ve adapted the recipe to make it a touch less sweet and with a splash more tequila, because that’s what I needed after the week I’ve had! I also muddled in a bit of cayenne pepper for a spicy kick! I love it when a drink makes my lips tingle! Fill the margarita glass with ice and set aside or in the alternate, place the glass in the freezer for a few minutes. Muddle the chili pepper in the bottom of the cocktail shaker. 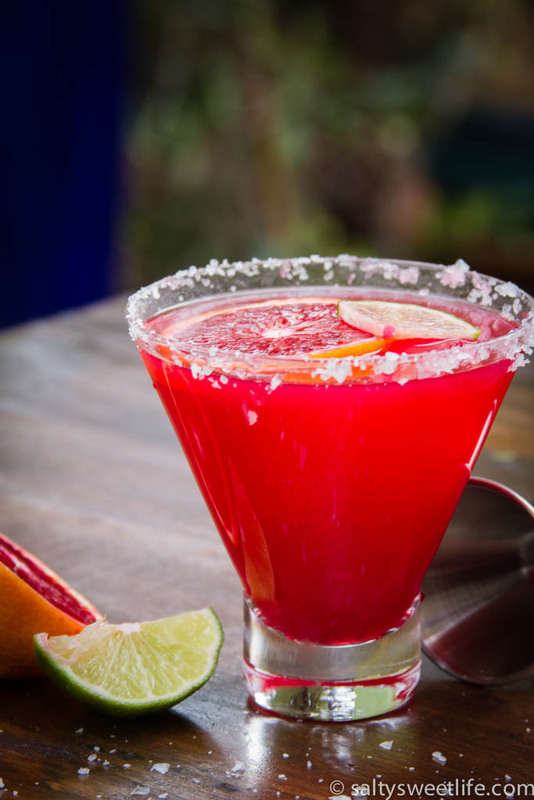 Add the tequila, blood orange juice, lime juice, simple syrup and bitters to the shaker and then add about a cup of ice. Dump the ice from the margarita glass. 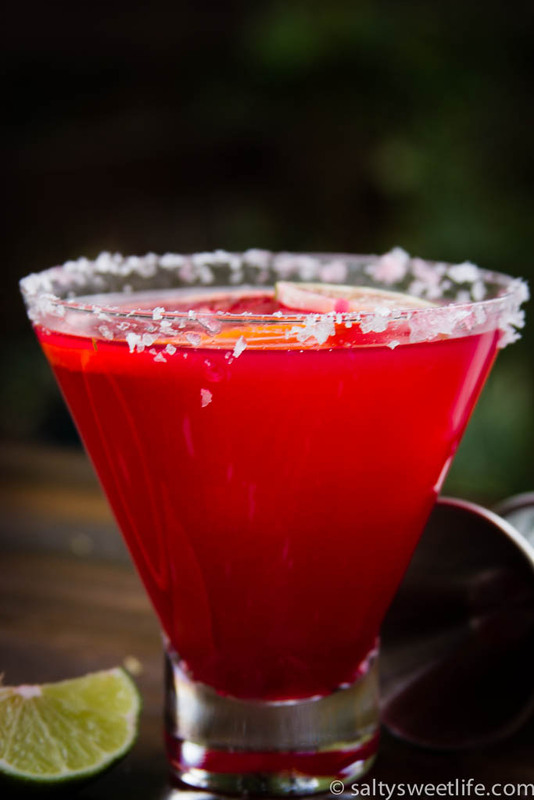 Wet the rim of the glass with a lime wedge and roll the edge over the sea salt. Now, give the shaker a few good shakes, then strain the cocktail into the salted margarita glass. Garnish with a twist of orange peel! *To make simple syrup, slowly dissolve 1 cup of sugar into one cup of water in a small saucepan over medium heat. Cool and store in the refrigerator. That is a lovely recipe. I live in Florida and you would think that blood red oranges would be easy to find. But, Sadly they are not. When I lived in NJ, I used to make Blood Red Orange Martinis. However, I like your idea much better. To make it spicy? I had never thought of that. I would use cayenne pepper to try this recipe. And your pictures are absolutely magnificent!! Thank you so much! They aren’t always available in the standard grocery stores here, either, but I can usually find them at Whole Foods while they’re in season! I love spicy cocktails! They are my favorites! Thank you so very much for the compliment on the photos–I am still very new at this! Previous PostMussels with Fennel, Italian Sausage and Créme Fraiche plus Rosemary Lemon Bread! Next PostDowntown Las Vegas Pub Crawl!